I was fairly conservative on this Saturday's trip to the Green Market. There really wasn't anything specific I wanted to get, so I just wandered around looking at all of the autumn fare until a few things caught my eye. 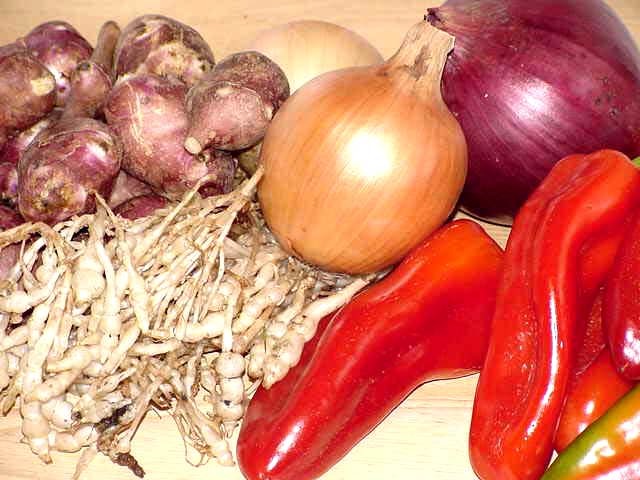 There's a fine assortment of onions available now so I grabbed a few different kinds from one stall. 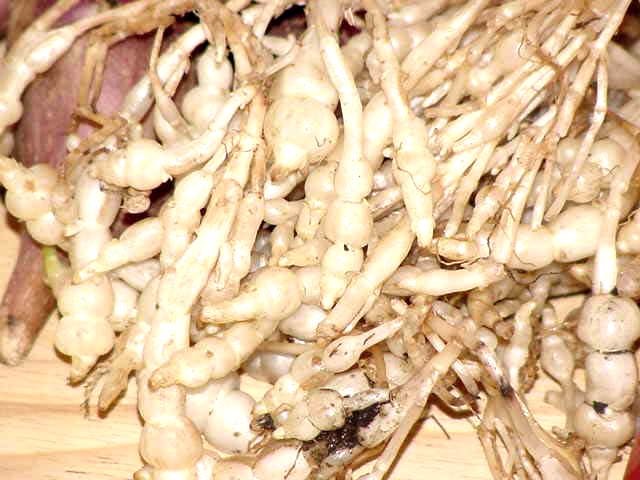 As I was getting ready to leave my eye was caught by some baskets of little white root-looking things. The sign said "French Crones." Never heard of them before. When I asked what they were, the guy at the market told me they were kind of like potatoes and could be eaten raw or sauteed. He offered to let me try one, so I did. It did taste a little like a raw potato, with that starchy crunch, but a much milder flavor. Nothing special, so I thanked him and walked away. And didn't get more than a few feet when the afterbite hit--just the barest hint of radish. Hmmmm. That was definitely more interesting, and I had no idea whether or not I would ever see them again, so I bought some. Here they are close up. I had a little trouble finding anything on them, but finally found this article at Mother Earth News. It turns out they're spelled crosnes (pronounced crones), hence the odd name. I had no idea what I was going to do with them, but I knew I had to try them. And then, as I was almost free of this one area, I saw a tub of Jerusalem artichokes that looked fresh and pretty. While I'm more familiar with those, I've never bought any. The only time I ever had them was at a restaurant years ago, where I ordered them in a pasta dish. What the menu description hadn't made clear was that the pasta was made from the sunchokes, which was a little disappointing because I couldn't really taste anything different about the pasta and the sauce was nothing special, so I was never particularly tempted to try them again. Until I saw these beauties at the market. So into my bag they went, along with some beautiful sweet Italian peppers I found at another stall. After the green market I made my way down to The Spice House. Can you believe I ran out of oregano? All of these foreign, exotic spices I've been playing with and I run out of one of my most staple herbs. I had made some salsa, and the little I had left just wasn't cutting it, so I had to go get more. 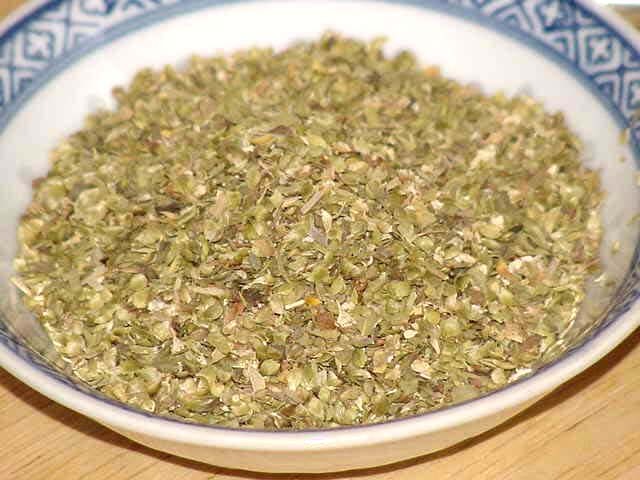 Ths is the oregano. Isn't it pretty? 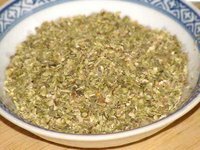 It's Greek oregano, the kind that claws its way out from between the rocky cliffs and is sweet and pungent and shines in Mediterranean cuisine. 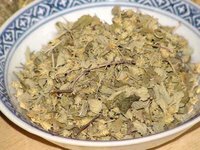 Its flavor is not quite as strong as Mexican oregano, which is less sweet and holds up to the stronger spices used in Mexican cooking. I 'm never sure which kind I should buy, because I cook with both styles and I want to maximize the experience for each. I usually alternate, buying Greek one time and Mexican the next. But this time I just couldn't decide which one to get. So I got both. And I was surprised at the difference between the two. The Greek oregano is drier and finer; the Mexican has more stems and twigs in it. Both have that same delicious musky scent, but it's sweeter in the Greek, and sharper in the Mexican. I know I'm truly a food geek, but I don't care. I love my two oreganos! And if those pictures weren't enough to give you an idea of the difference between them, here's a shot of the two together. Can you tell which is which? 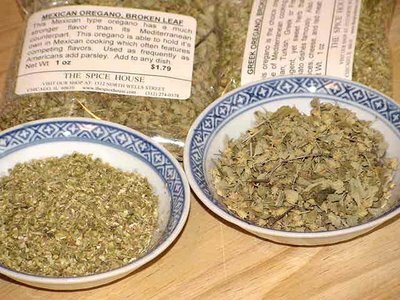 And surprise, surprise--oregano isn't all I bought at The Spice House. More on that next time. Best for a food product that I have heard in a long time. I wonder if you could make soup with them, like a peppery potato thing?